This plan is designed for the cyclist that wants to excel with Zwift racing. The goal of this plan is to improve your race starts, develop the fitness needed to perform with Zwift's unique physical demands, and have an improved race result. The plan is built by USA Level II Cycling Coach and Cat II road cyclist Paul Ozier. 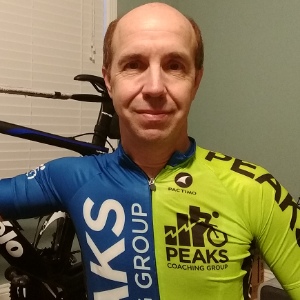 Paul has over 25 years of racing experience and more than 15 years as a cycling coach. Athletes coached by Paul have excelled to new levels, set personal bests, won races for their first time, and taken home Silver and Gold medals in state championships. Paul is an avid Zwift racer and understands the different physical abilities required to perform well and have loads of fun doing it. This is a 9 week plan. This training will develop your race start to a new level for use on Zwift. Your ability to hold your position will improve. Your overall race performance will improve to new levels on Zwift. You will start, ride, and finish strong! The training in this plan will also keep a road cyclist very fit and ready for most any challenge they encounter. Workout Files. On most workouts will be a downloadable file. These can be used on Zwift, ERG Video, Trainer Road and most other training software. Also .FIT files can be loaded on your Garmin to use as a workout on the road. This is specifically a Zwift training plan and all but a few workouts should be performed in Workout mode on Zwift or similar controlled indoor training platform. A series of intervals and ramps to build recovery adaptation. Have fun! Zwift races start like a sidewinder missile launch! These intervals will prepare you so you can handle the extreme power required to hang with the front group until they decide to back off the throttle and settle into a sensible pace. This may be the most important workout to aid in your Zwift race success! This workout uses the identical Race Warm Up before starting the launch training. The initial launch can have a rider having to put out 200% of FTP just to stay in contact with the front riders. Personally I let off the gas every chance I get to unload the legs, even if for 3 to 5 seconds. This workout has that very brief "rest" period. In a powerful launch like on Zwift, every single second of rest can add up to a difference in where you finish. As you get more trained to this workout be sure to up your FTP setting in the Zwift workout module so you can continue to push the limits. Or you can edit the workout in TrainingPeaks by simply increasing the % of FTP for the various steps of the interval. You may be surprised at the intensity of the 'launches'. It is perfectly OK to reduce your FTP setting in Zwift, or reducing the percentage of FTP on the Companion App if you need to the first few times you do this one. More training can be found here at my TrainingPeaks Training Plans page. Join a Zwift group ride. NOT a race! Find a group that rides around 2.5 w/kg. Keep a cadence of 90-95 and enjoy! Please do not chase the handful of riders that blast off the front trying to make every event a race instead of a ride. Stick with the leader at the published ride pace and have a moderate paced ride. This ride should not be a hard task and leave you feeling fresh enough to knock out tomorrow's super hard workout. IF YOU ARE feeling peppy, fresh, chomping at the bit, you can do this ride tomorrow, and tomorrow's big workout today. Just be sure you really have it in you to knock it out with quality! Workout build is only to calculate TSS. It is not used today. Workout build is only to calculate TSS. It is not used today. Ride Zwift flat course, small chain ring, light and easy on the pedals. 4 x 12 minutes at SST (Sweet Spot). During the 'burst' parts increase cadence by 10-15 rpm. This is very important to increase cadence.